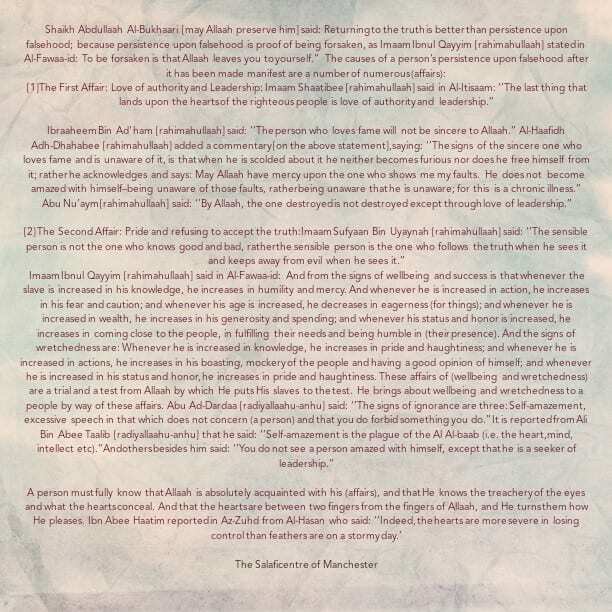 Imaam Ibnul Qayyim (rahimahullaah) said in Al-Fawaa-id: And from the signs of wellbeing and success is that whenever the slave is increased in his knowledge, he increases in humility and mercy. And whenever he is increased in action, he increases in his fear and caution; and whenever his age is increased, he decreases in eagerness (for things); and whenever he is increased in wealth, he increases in his generosity and spending; and whenever his status and honor is increased, he increases in coming close to the people, in fulfilling their needs and being humble in (their presence). And the signs of wretchedness are: Whenever he is increased in knowledge, he increases in pride and haughtiness; and whenever he is increased in actions, he increases in his boasting, mockery of the people and having a good opinion of himself; and whenever he is increased in his status and honor, he increases in pride and haughtiness. These affairs of (wellbeing and wretchedness) are a trial and a test from Allaah by which He puts His slaves to the test. He brings about wellbeing and wretchedness to a people by way of these affairs.